Sometimes when making smoothies we can fall into a rut where we keep making the same combinations and eventually get tired of them. To keep things interesting I like to bring in a variety of new ingredients, and recently I’ve started making beet smoothies. Their deep red color is pretty exciting. I was somewhat surprised to find that beets can be added to smoothies raw and unpeeled (assuming you’re using a powerful blender like a Vitamix or Blendtec). I’ve been adding them to a version of the ginger smoothie that I previously wrote about, as well as the vegetable V8-like smoothie. This is what happens when you add a beet to the previously green ginger-carrot-apple-spinach smoothie. The beet color totally dominates, even if you have a significant amount of greens. I usually add one medium-size beet to a 32-oz smoothie. I’ve found that the beet flavor does not go as well with the more subtle flavors of berries. To prepare them I scrub them with the same brush I use for carrots, and I cut off the very top and bottom the same way as well. I usually cut them into quarters so that they blend more easily. I also add a little bit of extra water or ice because they are pretty fibrous and can make the smoothie a bit thick. One thing about beets is that occasionally there will be one that is more bitter than usual. I haven’t found any reliable way to avoid this, so if you have one bitter experience, try again before you give up on beets. 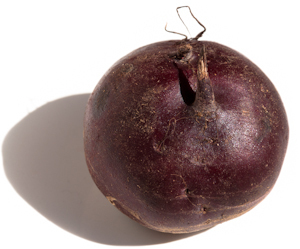 Beets do have a somewhat strong earthy flavor, which does not fade into the background the way carrots or spinach do. I personally enjoy the flavor, but not everyone will. If you want to ease into beets there are two things you can do to mellow their flavor a bit: you can peel and/or cook them. If you want to cook them, you would cook up a batch (steam, bake, or boil), then cool and store them in the fridge for use in smoothies. I vouch for this post. Beets are great for juicing/ smoothy making. The color is delightful! The earthy flavor is mild and perhaps more palitable to someone new to jucing than greens. Beets have a taste I was expecting. My daughter and I shared a whole small beet in our spinach, mango, banana, yogurt juice. Indeed it does have an earthy taste but a palatable taste I could endure. My daughter found it somewhat difficult to get down. I did not. It is different but for the benefits the taste will not detour me from juicing with it again on a frequent basis. I can tell from one try, three hours ago, that it seems to have added to my energy level. If for nothing else, I will definitely continue to add beets to my diet. Thanks for sharing your experience. Perhaps your daughter would like it better if it were peeled or cooked? I just bought some beets (roots and leaves) to try my luck at this. Could you help me with a couple questions? 1. By watching youtube, it suggests baking beet at 350F for about 25min. Given I will be blending them, is it ok to bake less time? I just want to remove a bit of the earthy taste that everyone mentioned. 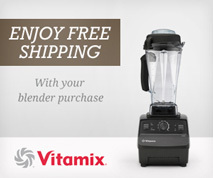 I have a Vitamix. 2. What do I do with the leaves? Can I blend it in in lieu of spinach or kale? 3. For either recipe on your site (ginger or V8), how many beet do I add? Sorry for the delay; I lost track of this comment. 1) Given that you can eat beets raw, there wouldn’t be any harm in cooking them for less time. But my take would be that if you’re going to go through the effort of cooking them, you might as well cook them all the way. 2) Yes, you can blend the greens. They are extremely similar to Swiss Chard. 3) I usually add one medium-small beet. 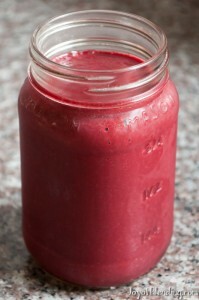 I love the taste of beet smoothies (with other veggies etc…but cannot handle the intense graininess of them. It is very hard to swallow and I use a vitamix for 2 minutes….any ideas? Does cooking the beets first help? Cooking and/or peeling makes them smoother…. Thanks, I will try cooking them first! Don’t forget to add the delicious beet tops (greens). Or, use them to add a more subtle beet flavor to a green smoothie, sans beets. Outside of my Vitamix they are awesome sautéed with garlic and olive oil. Prepping to try juicing/blending beets and have read a variety of opinions on wether or not include the greens. Thoughts? Yeah, you can really go either way. The greens are edible and nutritious, but they will of course change the flavor. I’d recommend trying a bit and seeing if you like it. 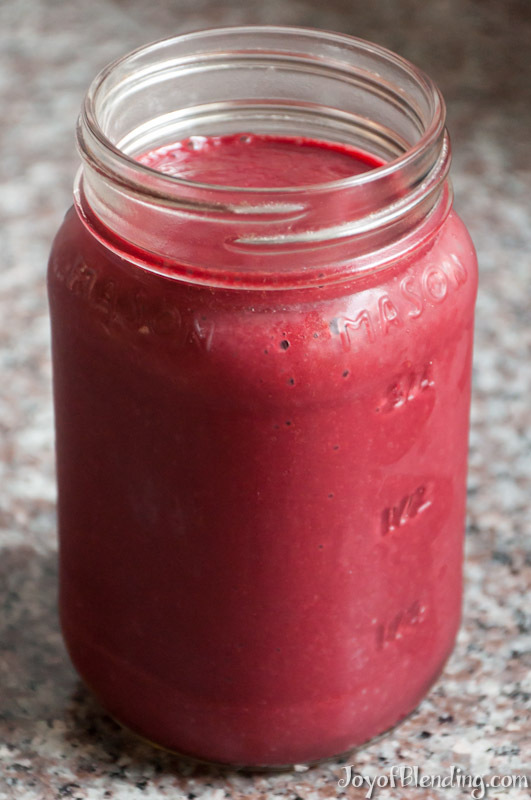 Adding beets makes for a lovely colored smoothie. This is only my 2d day in the VitaMix club and I’m enjoying the possibilities. I just made a smoothie with one small apple, 1/2 beet, raw and peeled, 1/2 cup carrots, steamed, and a handful of spinach. I had to add water to bring the mix out of the applesauce range. The flavor was beet dominant and not that appealing. I then added a little packet of dried orange essence and, perfect! The orange flavor pairs well with the beets and made for a delicious smoothie. Interesting! I’ve never tried adding orange essence. Sounds like it could be good! Please, any recipies For smoothies with fresh beets, I hate the taste of them & beet juice makes me gag..but I have HBP & I KNOW BEETS help lower HBP! ANY Advice on how to mask the beet taste ?? Thanks ? As mentioned in the post, if you want to mellow the flavor the most, cook and peel the beets. Also, ginger helps mask strong flavors. Love reading and trying smoothie recipes. Working on my high B P so using beets.